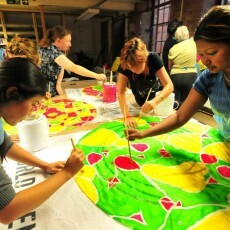 As part of the World Event Young Artists festival, established textile maker Ali Pretty (Artistic Director of Kinetika) in collaboration with local spoken word artist and writer Panya Banjoko were commissioned to deliver a textiles project with Nottingham community groups and families. 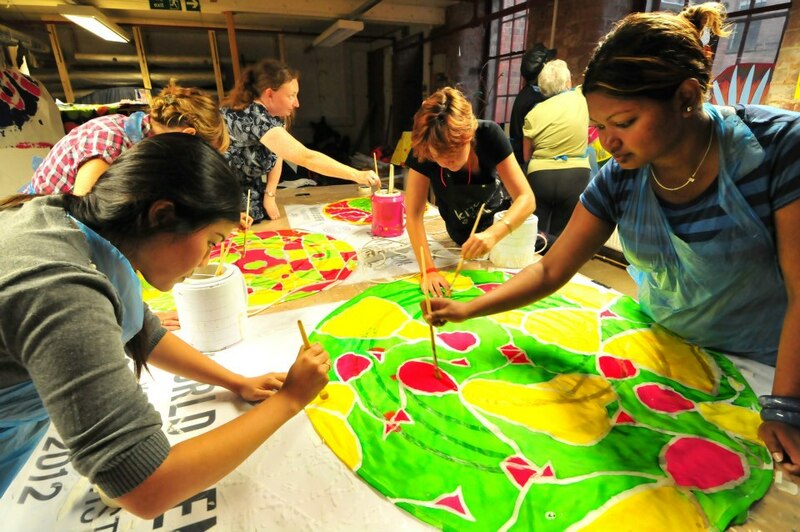 In venues across the City, Panya drew out ideas and stories that were then used by Ali to inspire the silk designs that community groups helped to develop. Six mobile structures, decorated silk discs mounted on rods, were also produced by the community groups and helped decorate the square. Following on from that, and inspired by the WEYA themes of global cultures and creative exchange, a 45-metre length of silk was produced using batik, with text and imagery created by local families and the names and place of birth of all the visiting artists. This was painted live in the Old Market Square attracting an audience of over 2,500 people.